Our maximum capacity is 150 people. 150 is very roomy in the Summer and Fall at our venue, as We have many outdoor spaces to explore. During the Spring and winter months we recommend keeping your guest count at or below 120, as most guest will be in our reception hall at all times. ​​​​​​​​​We are huge dog-lovers here at Maple Leaf Events! We will allow dogs only if they are part of the wedding party, and all service dogs are welcomed. We ask that you keep dogs on a leash while they are outside and clean up any messes they make. tax is included in your booking rate and no gratuities are added to this rate! We attempt to schedule rehearsals the day before your event whenever possible. If that is not possible, we will figure out another time that works for us and your group! ​​​​​​Living in the Pacific Northwest we know that it is impossible to predict weather! Our venue is set up with a full reception hall that has heaters, etc. So if it rains on the big day, your ceremony can be held inside. Some brave clients have gone ahead and done it outside anyways. We are open to either! do we get the venue? ​​​​​Our rental is from 10am to 10pm on the day of your wedding. Having said that we pride ourselves on being flexible! Need to get in a little earlier because of an early ceremony? We got you covered! No event the day before? Come on in and do your setup! ​Absolutely! We have a gorgeous outside landscaped area that is designed for the ceremony to be held right on-site. This makes it simple, so guest don't have to drive to a second location. Once they arrive, they stay in the same location for the entire event. We require our clients to get a liquor permit from washington state ($10). At that point clients can decided if they want to bring in beer/wine or hard alcohol. We do caution clients that you are responsible for your guests behavior and any damage they cause, so limiting the amount of hard alcohol may be in your best interest. We do allow wedding parties to consume alcohol in our suites while preparing for their big day. All Washington state liquor laws must be followed including no consumption by persons under 21 years of age. Let's put that pinterest board to good use!!! Our venue has a few simple decorations that make it festive, but we also allow you to bring in any decor you want to make your event yours! We allow items to be hung from our walls and ceilings with push pins. We've had groups do very elaborate decorating and some have left it simple and taken advantage our venue's natural beauty. At our venue, we welcome live bands, DJ's and any other form of entertainment you can come up with. Some of our clients bring in speakers and do their own music as well. We know music is an important part of the big day! We only allow one wedding at a time on-site. This allows us to give you our full attention and privacy while your event is happening. We are also located on private property so the only people who will be at or near your event are your guests and loved ones. Our restrooms are full indoor facilities with indoor plumbing and sinks! Our reception hall features men and women's restrooms, 2 stall each. We also have 3 additional restrooms in our suite area, located right next to the reception hall. That is a grand total of 7 restrooms for guests that are not porta-potties! New in 2018! 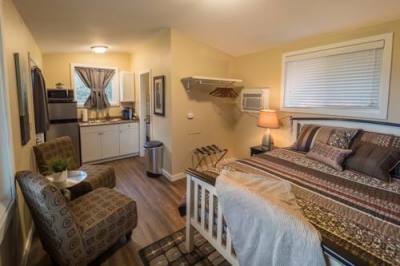 3 on-site rental cabins full of all the amenities your guests will need. These are rented seperately on AIRBNB/VRBO. Our venue provides all tables and chairs at no additional charge.